It’s another cold and snowy day here in Southern Ontario. As I stood looking out the window watching husband dig out the driveway for the second time this week the thoughts of chicken soup came to my mind. He was going to need something to warm him up with winds chill in the minus 25 c. area. So, I headed to the kitchen to make something warm. 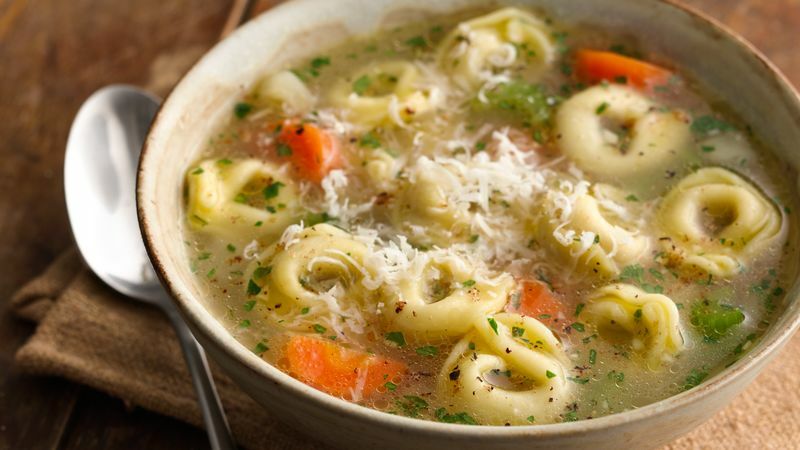 I threw together a little magic and came up with the most wonderful Chicken Tortellini Soup. This is definitely another recipe heading into the Cottage Cook Book, but also one I thought I would share with you today. Sauté onion, celery, and carrots in olive oil in a soup pan. When onion becomes transparent add parsley and peppercorn. Heat for two minutes, then add broth, chicken, and tortellini. Allow to simmer for 1 hour. At the time of serving, add 2 tbs of Grated Parmesan to top of each bowel. Serve with a roll or biscuit. Looks lovely! Too bad I’m low carb. The best I get is a beanless chili with round steak. But you do remind me I need to add some keto recipes now that I’m back on it! This sounds amazing!!! Must make this!